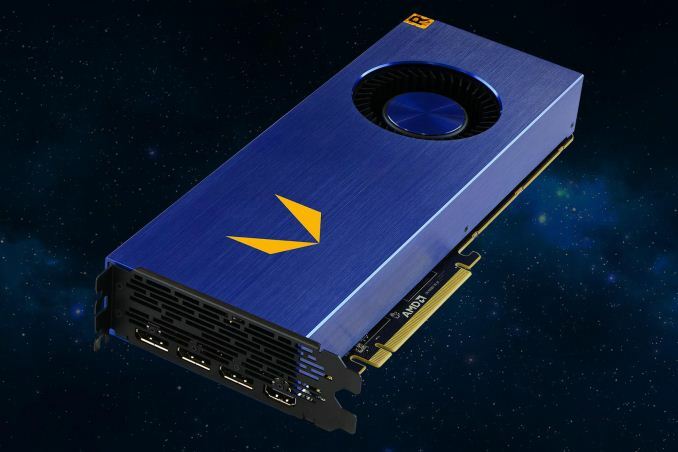 After what appears to be a very unusual false start, AMD has now formally launched their new Radeon Vega Frontier Edition card. First announced back in mid-May, the unusual card, which AMD is all but going out of their way to dissuade their usual consumer base from buying, will be available today for $999. Meanwhile its liquid cooled counterpart, which was also announced at the time, will be available later on in Q3 for $1499. Interestingly, both of these official prices are some $200-$300 below the prices first listed by SabrePC two weeks ago in the false start. To date AMD hasn’t commented on what happened there, however it’s worth noting that SabrePC is as of press time still listing the cards for their previous prices, with both cards reporting as being in-stock. Meanwhile AMD has also posted the final specifications for the card, confirming the 1600MHz peak clock. Sustained performance is a bit lower, with AMD publishing a “Typical clock” of 1382MHz. It’s worth noting that this is the first time AMD has used this term – they’ve previously used the term “base clock”, which is generally treated as the minimum clockspeed a card under a full gaming workload should run at. AMD is typically very careful in their word choice (as any good Legal department would require), so I’m curious as to whether there’s any significance to this distinction. At first glance, “typical clock” sounds a lot like NVIDIA’s “boost clock”, which is to say that it will be interesting to see how often Vega FE can actually hit & hold its boost clock, and whether it falls below its typical clock at all. Feeding the GPU is AMD’s previously announced dual stack HBM2 configuration, which is now confirmed to be a pair of 8 layer, 8GB “8-Hi” stacks. AMD has the Vega FE’s memory clocked at just under 1.9Gbps, which gives the card a total memory bandwidth of 483GB/sec. 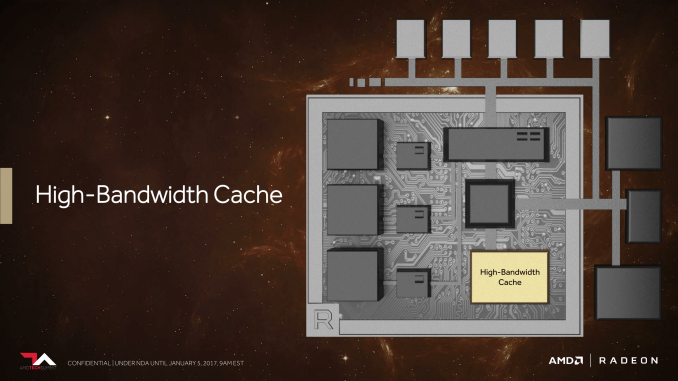 And for anyone paying close attention to AMD’s naming scheme here, they are officially calling this “HBC” memory – a callback to Vega’s High Bandwidth Cache design. As for power consumption, AMD lists the card’s typical board power as “< 300W”. This is consistent with the earlier figures posted by retailers, and perhaps most importantly, this is AMD’s official typical board power, not the maximum board power. So we are looking at a fairly high TDP card, and given that AMD has had a great deal of time to sit and work on their reference blower designs over the last few years, I’m anxious to see what that means for this initial air-cooled card. For display outputs, the Vega FE devotes its entire second slot to airflow, so all of the display connectors are found on the first slot. Typical for AMD cards of the past couple of years, we’re looking at 3x DP 1.4 ports along with 1x HDMI port. AMD is also throwing in a passive DP to SL-DVI adapter in the box. Moving on, let’s talk about the software setup for the Vega FE. As this is a card meant for (in part) game developers, AMD has opted to give the card access to both their pro and gaming drivers. Taking things one step further however, rather than making them separate downloads and installations, AMD has merged both drivers into a single install. Users can now download a single driver package and simply switch between driver modes in AMD’s control panel, allowing quick access to both driver types. Unfortunately AMD hasn’t released much more in the way of detailed information on how driver switching works. In particular, it’s not clear whether switching requires a reboot or not; I would assume not, but it remains to be seen. Ultimately the primary purpose of this switch is for allowing game developers to switch modes for testing, going from pro driver mode for development to gaming mode for testing. The difference, I suspect, is less about driver code, and more about what driver optimizations are enabled. Games can get away with numerous hacks and optimizations in the name of performance, whereas professional applications need deterministic accuracy. 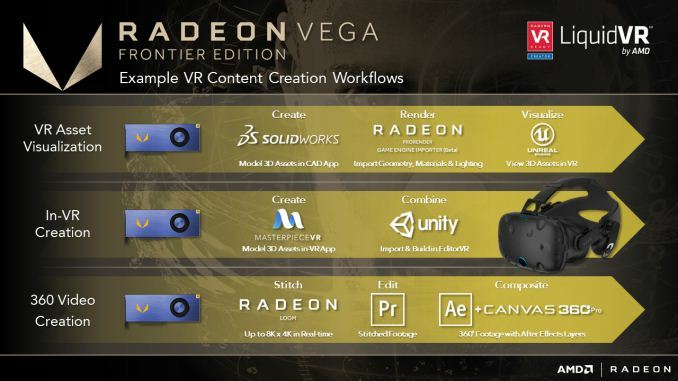 Otherwise, the driver situation touches on probably what remains one of the least-clear points of this product launch: who is the Radeon Vega Frontier Edition for? AMD is doing everything they can to encourage their typical Radeon consumer base to wait for the forthcoming Radeon Vega RX cards. In the meantime the company is stating that the card is “For Data Scientists, Immersion Engineers, and Product Designers” and certainly the pricing is closer to a professional card than a consumer card. Complicating matters is that AMD has been posting performance figures for SPECviewperf, Creo, other distinctly professional workloads, the kinds that typically go hand-in-hand with certified drivers. And at least for the moment, it doesn’t appear that AMD’s drivers have been certified (not that we’d expect them to be for a new architecture). At a high level the Vega FE seems to compete with NVIDIA’s Titan Xp – and certainly that’s how AMD is choosing to pitch it – though this isn’t helped by the fact that NVIDIA isn’t doing a great job of establishing a clear market segmentation either, particularly since the launch of the GeForce GTX 1080 Ti. The Titan Xp is most certainly a partial gaming card (albeit a very expensive one), whereas AMD is focused more on professional visualization use cases that NVIDIA is not. Though where both overlap is on the compute front, where both the Vega FE and Titan Xp are essentially “entry-level” cards for production compute work. 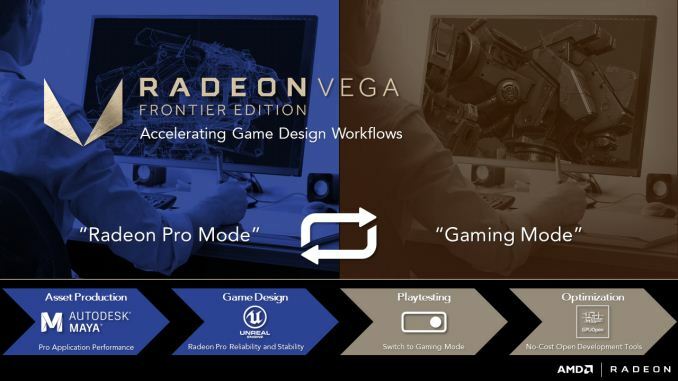 Otherwise, it may be better to treat the Vega FE as a beta testing card, especially given the “frontier” branding and the fact that AMD is clearly attempting to build out a more complete ecosystem for the future Vega RX and Instinct cards. As for compute users in particular, AMD will be releasing the ROCm driver a bit later this week, on the 29th. Vega FE has a lot of potential for a compute card, thanks to its high number of SPs combined with equally high clocks. However serious compute users will need to code for its capabilities and idiosyncrasies to get the best possible performance on the card, which is all the more reason for AMD to get cards out now so that developers can get started. Compute will be the long-tail of the architecture: AMD can tweak the graphics performance of the card via drivers, but it's up to developers to unlock the full compute capabilities of the Vega architecture. Wrapping things up, for anyone interested in picking up the Vega FE, AMD is currently only linking to Newegg’s storefront, where both the air cooled and water cooled cards are listed as “coming soon”. Otherwise SabrePC lists the cards in stock, albeit at prices over AMD’s MSRP. Ryan - is this all we get, no review sample for you guys. Correct, we were not sampled. To the best of my knowledge, no one was. Well, Raja has repeatedly stressed that the gaming Rx Vega version will be faster, so it's likely that reviews now would give false impressions. I do hope though that developers will have time to optimize for Vega by the time the Rx version comes out. "What leads you to think the card will sell out?"